If you want to learn the ins and outs of poker, don't watch movies about poker. Seriously, you'd have more luck taking medical advice from Yahoo! Answers. I'm sure you had a sneaky suspicion that the silver screen isn't the fountain of information for poker rules and etiquette, but it's always nice to have a bit of closure. Here are 5 incredible examples of lies, deceit, treachery and general inaccuracy that help build the constant struggle of a relationship that is Hollywood and Poker. Maverick - 1994. This one came out a year before Braveheart, which was a slightly bigger success at the box office. Did you catch that? There was a slight hesitation between 0:50 and 1:38 before Mel flipped over the final card to show the winning hand. Incase you're still not 100% sure, slowrolling is where you know you have the best hand, but you take longer than you need to before showing your opponent. Don't do this. It's absolutely horrendous poker etiquette. I can understand why most poker scenes include an almighty slowroll – it increases tension and excitement. However, in real life it just increases animosity and fistfights. It's not cool and it's not clever. You wouldn't appreciate it if your Doctor slowrolled you on a diagnosis, so don't use this tactic at the poker table. 2) Betting more than the other player has in front of them. Lock, Stock and Two Smoking Barrels - 1998. If you're not British you may struggle with the lingo in this one. The important/inaccurate part starts at 2:00. Along with purporting Nic Cage as an actor worth watching, this is one of the biggest lies ever told by Hollywood. Fact: This isn't actually a Hollywood film of course, but it just so happens to be a prime example of the mistake most films make. You cannot force your opponent to wager more than the amount of money they have in front of them. If you're sat at an online poker table with $5 in front of you, it's not permitted for your opponent to raise you $5, plus your brand new Logitech keyboard and mouse. You can't lose more than that $5 in one hand. It's just not how poker works. Sure, there may be smoke-filled underground poker games that have these devilish rules, but if you get involved in games like that then you probably deserve what's coming to you. So don't fear – you're not going to sit down in a 1c/2c online cash game and walk away a set of house keys lighter. Poker has rules, but Hollywood loves to gloss over this one. 3) "I call… and I raise"
You're either calling or you're raising. You can't do both. The Cincinnati Kid - 1965. This scene falls foul of about 100 poker inaccuracies in the short space of 7 minutes (e.g. raising more than what the other player has, a warranted slowroll). The "call and raise" blunder though is at 3:50. The problem with saying something like "I call your filthy bet… and I raise you this offensive amount" is the "…" bit. Saying "I call" followed by a pause can easily lead to a misunderstanding. The dealer may begin to deal the next card, or a player acting after you may begin to make their action based on the belief that you're calling and not raising. It sounds like a trivial point, but describing your action in this way can and will cause problems. Even though this is an honest mistake to make, other players may see this as a form of angle shooting, as it allows you to potentially gain more information than if you had been more transparent (i.e. other players won't accidentally attempt to act out of turn). Stick to just saying "call" or "raise" in future – it helps to prevent confusion and unhappy players. Rounders - 1998. Best Russian accent ever. This is a comically bad example of how obvious poker tells aren't. Most players don't sweat profusely or gasp for air when they bluff, just as most players don't eat an Oreo every time they've got the stone cold nuts. As awesome as this would be if it were true, you don't get helpful indicators like this when playing live poker. Your opponent isn't going to tuck in to a meatball marinara sub when open-limping with AA, and they're not going to down a shot of Jack each time they hit their straight. 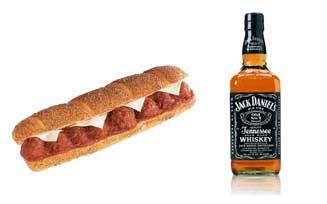 Meatball Marinara + JD = Food and drink of choice for bad poker players everywhere. I'm more of an online player than live player, so I'm not the best person to ask about what kind of tells you should be looking for. You can find out good information about this stuff in Mike Caro's Book of Poker Tells. There's also a cool live poker tells site called TellsKitchen (ha), which has a bunch of videos analysing the tells of famous live poker players. 5) Poker players are well-groomed. Casino Royale - 2006. Winning squillions of dollars and wearing a suit. Standard Bond. I wasn't wearing a suit the last time I played a hand of online poker. However, I was wearing a pair of boxers and a lucky sock. Unfortunately (for me at least), poker isn't quite as glamorous as it's often made out to be. In fact, it makes me feel warm inside knowing that the player on the other side of the computer screen probably has a worse sense of style than I do. I would say I dress for comfort than looks, but that fails to explain why it's been nearly 2 weeks since I've done a proper bout of washing/laundry. I'm pretty sure that if you lined up 100 online poker players in a row, the majority of them would smell more like the inside of a packet of ramen noodles than the latest Giorgio Armani cologne. 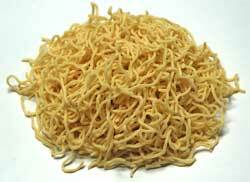 Ramen noodles; because you can never have too many pictures of food. The beauty of online poker is that if you stick a piece of blu-tack over your webcam lens, you'll never have to live in fear of anyone ever seeing what kind of state you're in as you're playing 12+ SNGs at a time.